Florida Workers and Students Fight Back! All around Florida on Friday, students and workers help rallies and marches to voice their opposition to the anti-union attacks, attacks on women’s rights, students and education, and the environment. 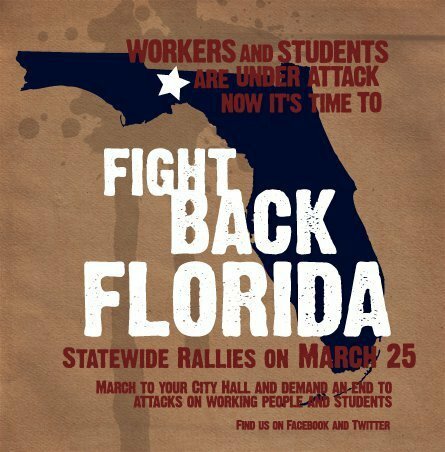 On March 25th, cities across Florida will be holding rallies and marches to demonstrate that Florida workers are going to fight back against the recent anti-worker measures introduced by the state legislature. Workers stand with taped mouths symbolizing the silencing of workers’ voices, Tallahassee, March 7. As the state legislative session in Florida begins, the working class is increasingly becoming a target by lawmakers. The anti-worker state session began quickly, starting on March 7 when a senate committee held a hearing on SB830, a bill that would prohibit unions from automatically collecting dues from paychecks (a voluntary deduction that workers decide to have) and would prohibit dues money from being used in political activity. Workers, students, and activists stood outside the meeting with tape over their mouths to represent the silencing of workers’ voices that this bill represents. The following day saw statewide rallies called “Awake the State,” which took place in 32 cities to oppose the attacks on workers by the state’s Republican Party. The event drew out over 10 thousand people statewide, dwarfing the Tea Party rallies in Tallahassee and elsewhere in the state. These rallies were also held in opposition to the renewed attack on teachers and public education in Florida. Last year, SB6 would have pegged teachers pay to student test scores, ignoring the various factors that go into test results. However, due to intensive grassroots activism, then governor Charlie Crist vetoed the bill. However, a version of the union-busting bill has been revived in the new legislative session and is likely to pass. In addition to the legislative attacks on collective bargaining and on teachers, hundreds of unemployed workers and their supporters protested in Tallahassee to oppose House Bill 7005, which cuts unemployment benefits. HB 7005 reduces the number of weeks of unemployment compensation from 26 weeks to 20 weeks, and also cuts the taxes imposed on business which are used to pay for unemployment. The bill passed the full house March 10. It is estimated that 400,000 Floridians currently receive unemployment benefits: the state’s unemployment rate is about 12 percent. About 1 million people in Florida are without jobs. The South is home to nine of the 10 states in the United States that have no collective bargaining rights for public workers, and Rick Scott recently made it known that he would like to see Florida become the 11th state (after having previously said that he did not want to go after those rights). 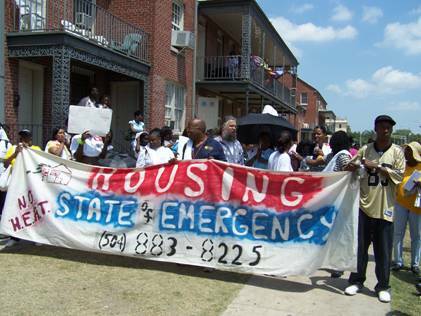 This shows the importance of organizing in the South, where workers are disproportionately denied a voice. Southern workers are now organizing in spite of these unfavorable conditions. While public sector workers in Wisconsin and Ohio fight to keep their collective bargaining rights, public workers in the South should begin fighting for those rights in the first place! These anti-worker attacks follow attacks by governors across the country, as does the effort to fight back by workers. Only a fight back movement that advocates worker power can stop these attacks and move the workers movement forward. In Florida, workers are beginning to build a movement that will fight back! A recent AP article points out that 9 of the 10 states in the United States that lack collective bargaining rights for state workers are found in the South. The article points out that in places like Virginia, the drive is to move pensions from a government benefit for state workers to an investment in the private sector. This is a Neo-Liberal move that is in line with the continued “enclosure of the commons” method of taking everything that is in the public sector and making it for profit in the private sector. When unions are unable to negotiate for their own workers, the balance of power remains more firmly at the top with the most powerful of society. As Leftists, we don’t merely want to call for a “balance of power,” however. Our goal is to tip the balance in favor of the working class so it can itself achieve power for itself as a class. The fact that the majority of states that lack collective bargaining for state workers fall in the South underlines the argument that organizing in the South should be a top priority for those who want to build the labor movement in general. Meet on neutral ground, corner of St Louis and Basin St.